Udaipur: Correct identification of plants are essential for scientific validation of any plant drug and for identification purpose, prior knowledge about relevant flora is also necessary. This was expressed by Dr. Vartika Jain who is working as Assistant Professor, Department of Botany, Govt. 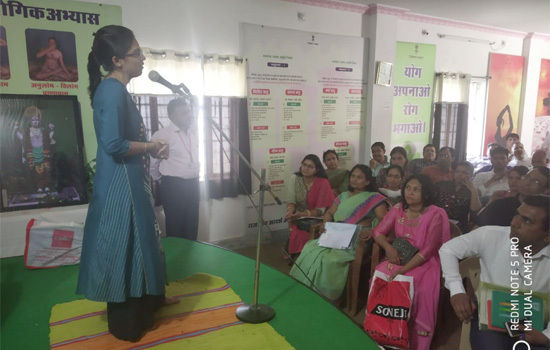 Meera Girls' College, Udaipur in a three day Re-orientation training program of Ayurvedic Medical Officers organized at RTDC Hotel Kajri on Wednesday as a Trainer. She was introduced to participants by Dr. B.L. Jain. Dr. Vartika explained difference between floristic, ethnobotanical and medicinal plant survey and gave important clues for preliminary identification of plants in a field visit. She also explained the technique to properly preserve a plant for making a herbarium specimen and which are the important indexed Herbaria of country where the preserved plant specimen could be submitted and identified correctly. She emphasized on keeping the voucher specimen of a plant/herbal drug before starting any scientific laboratory research on the plant. Various methodologies to document the medicinal importance of the plant species as given by local folk were also explained to participants in detail. Later Dr. Vartika also gave information about various folk medicinal uses of some local plants growing in surroundings of Udaipur for example Guduchi, Adusa, Aak, Ghav-patti, Cholai etc. along with their pictorial presentation and raised questions on preserving indigenous medicinal herbs of city. Further, she proudly informed about the First Indian Book selected for Mary. W. Klinger Award Finalist 2017-18 by prestigious Society for Economic Botany, USA which is 'Compendium of Indian Folk Medicine and Ethnobotany' 'containing concise information on ethnobotany of about 4600 plant species growing in India and authored by her and Dr. S. K. Jain. There were 40 Ayurvedic Medical Officers from all over Rajasthan who attended the course and asked their queries about difference between collection of fresh/dry plant part, some suitable areas of Rajasthan for collection of particular medicinal plants etc. and Dr. Jain served them with proper answers. In the end, Dr. P.L. Choubisa extended her heartfelt thanks to her for delivering lecture on such an important topic relevant in present context when plant diversity is depleting rapidly and experts in plant identification are also rare. Udaipur: Robert Allen Zimmerman is the most prominent folk song writer and singer. He renders folk songs in the unique style. Many songs on different themes has been composed and performed by him. One of the very famous song “blown in the wind focuses on humanity issues with a great philosophy. The traditional folk songs has been rendered in rock and roll style in a peculiar manner..A. Zimmerman is called bob Dylan. He expresses the suppressions and indiscriminate about down trodden and marginalized societies. So many questions are raised in his songs against the malice and ruthless politicians. No doubt there are answers but it is so essential the nobility and staunch to find out and implement to gain the goals as we observe in the song, “Blowin in the Wind’. For the demand of equality and human rights when is avoided by orthodox and detectors then suppressed people as victims have to adopt the way of violence. Since last decades we observe, there is not good human environment in perception of peace, prosperity and equalities in economic and social justice across the world so it is generally considered that music and literature might be great influenced sours for expression of views and grievances, messages inner core of cardiac and to protest against negative forces and abrupt volcano so upheaval. We see the dense philosophy and the great features in bob Dylan’s songs after introspection by him when his beloved waives dead. The performance of Bob Dylan has been appreciated throughout the world. He has composed a number of albums with collaboration of the Columbia Company which is one of prominent film company of United States of America and filmed a documentary too. The Swedish noble prize academy which is also notorious, cause of indiscriminate and partialities in selection of aspirants of the glorious noble prize since the juries of Swedish noble academy used to negate many African writers as Chinua Achebe, the father of African novel. In these days, there are many poets imbibe the ventures to gain name and fem; it is difficult to write on different theme for beneficial achievements of common people. Bob Dylan’s songs produce not only entertainment but also rise a voice for justification so his songs are called the voice of common people. Actually many orthodox and detectors arise hindrances against the voice and ventures of victims of suppression has to live miserable leaves who have been marginalized after synched their rights of equality. They have to face to hazardous and harassment too, even they are murdered and cast into fire of disgusting fire. So courageous and pioneer of message and music, he performs as prophet for welfare of human beings. The American folk laureate, Bob Dylan’s the magnificent performance has cast spell and charmed over the world.